A: Typically, if the cost to repair your car exceeds 75% of its market value before it was damaged, then it’s considered a total loss by most insurance companies. Insurance policies contain clauses that limit them from paying more than your car is worth. The insurance company makes the determination if your car is a total loss based on repair costs, salvage value and pre-loss market value. Wash the vehicle by hand with cool water and a very mild car wash solution using a soft cloth or sponge. Always use clean fresh water. Wash your vehicle in the shade. Do not wax or polish the vehicle. This will allow the finish to dry and harden completely. It is recommended to wait at least 60 days before waxing. Although the clear coat reaches its maximum hardness in 30 days, there may still be some additional cure-out of solvents for another 30 days. Q: Will the insurance company guarantee your work? A: We guarantee our own work, but the insurance company does not have the legal right to guarantee a third party’s work. Q: Who pays for repairs? A: It depends on the circumstances. If you were at fault, but have comprehensive or collision insurance, the insurance company would pay the costs minus your deductible. If the other party was at fault, their insurance company should pay. Q: Do I have to accept the insurance company’s appraisal of damage? A: No. Check the “Appraisal Clause” in your policy if you have differences with their appraisal. It allows you and the insurance company to gather an opinion from an appraiser you both agree upon, or a third-party “Umpire” if you cannot agree. A: If you have purchased rental car coverage and were not responsible for the accident, you may seek reimbursement from the insurance company or, if another driver was responsible for the accident, their insurance company. You have the right to choose any collision repair facility to repair your vehicle. Select the shop with whom you feel most comfortable. You do not need to obtain more than one estimate. Since you decide who will repair your vehicle, contact that shop for an estimate. There is no law requiring you to get estimates from multiple repair shops. Make sure the shop you select is able to manage the paperwork and negotiations with your insurance company. Roy Rogers Body Shop will handle everything on your behalf. Never drive a vehicle that could be unsafe. 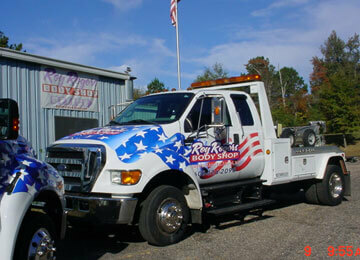 Roy Rogers Body Shop offers 24-hour towing services. Rental car pick-up and return are available so you don’t have to be without transportation. Have your vehicle towed directly to the shop of your choice. Towing it to a storage lot can incur additional expenses and leave your vehicle vulnerable to theft and vandalism. Roy Rogers Body Shop’s premises are secured to protect your vehicle. You do not have to drive your vehicle to a claim center. Ask the insurance company to send the appraiser to Roy Rogers Body Shop to inspect your vehicle. Choose a shop that is equipped to handle today’s high-tech vehicles. State of the art systems like frame straightening and paint mixing are standard at Roy Rogers. We also have the most experienced collision repair technicians in Laurel, MS.